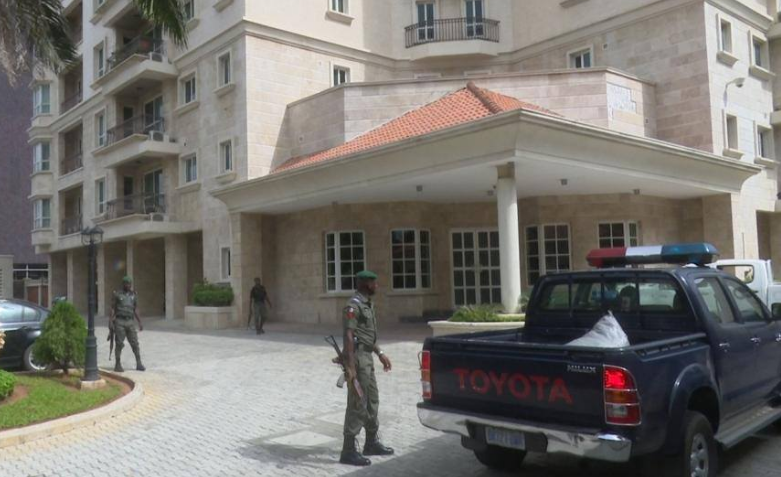 Details emerged over the weekend on the cash found at Osborne Towers, Ikoyi, Lagos. The EFCC was on the trail of some high-profile tenants when it found the $43.4 million, £27,000 and N23 million at House 6, Apartment 7B, it was learnt. Four of the tenants have been quizzed; a petition is pending against the fifth. The building, it was learnt, had been under surveillance because of the tenants. Sources said a whistle-blower alerted the EFCC about the apartment in which the huge cash was recovered. When the EFCC moved in, a source said, it was unaware that the National Intelligence Agency (NIA) had a Safe Apartment there. The anti-graft agency, according to the sources, had been trying to identify the tenants’ assets, including choice apartments in the towers. The whistle-blower, it was learnt, might have had knowledge of the EFCC’s discreet investigation and decided to help. But, as it turned out, the apartment does not belong to any of the tenants. One of them was said to have sold his stake in the towers. A source said: “As at the time of the EFCC’s operation on Wednesday, about five high-profile tenants, who are either being investigated or on the radar of the commission, were suspected to be living or having apartments there. “Among them are two former governors, a director of the Nigerian National Petroleum Corporation (NNPC) and two prominent lawyers. “So, when the whistle-blower raised the red flag, the EFCC was quick to move in without knowing that the 7B apartment is a safe house of the NIA. “There was excitement in the Lagos Zonal office of the EFCC about a breakthrough. This was why the operation started between 10am and 11am,” the source said. He said EFCC was hesitant to cooperate with the NIA. A government official, who pleaded not to be named because of “the sensitivity” of the matter, spoke last night in what transpired between EFCC and NIA. “There was a case of some cash released for contingency assignment by presidential fiat through the NIA account. The release was based on the directive of ex-President Goodluck Jonathan. “When the EFCC began the investigation of some Politically Exposed Persons (PEPs), it traced the movement of the cash to NIA account. Instead of seeking explanation from the Director-General of NIA, Ambassador Ayo Oke, the EFCC wrote directly to the Central Bank of Nigeria( CBN) to demand the details of the transactions on the said account. “In fact, the documents obtained from CBN included other sensitive operations and overhead. The NIA took exception to it. When President Muhammadu Buhari intervened, he saw all the records that neither NIA DG nor any staff benefited from the said funds. “NIA actually transferred the whole money as directed by the ex-President to another dedicated account. Subsequent EFCC investigation did not indict NIA. As for Wednesday’s operation, it was true that DG of NIA rushed to the Acting chairman of EFCC, Mr. Ibrahim Magu, who promised to intervene. The NIA boss only asked EFCC to retrieve the cash without making a public show of it in the media. According to the source, the EFCC secured clearance from a senior intelligence officer before continuing its operation after entreaties from the NIA. Nigerians have continued to raise questions about the ownership of the mystery cash, which the NIA has claimed. Among the questions is that if the money was meant for operations, why has it not been spent in two years? Was there any need for it, considering how long it has stayed unspent? liars..it belongs to a politician and they know the person. Nigeria!, Nigeria!! Nigeria!!! we hail thee. Within short period of time, these powerful thieves have lobbied their way through NIA boss to claim the loot back. They have reached an agreement with some unscrupulous officers of NIA to claim the ownership of that money and promised them to give them their own share. My advise for the NIA is to stay clear out of this investigation, not interfering with EFCC investigation because the World is watching. It is better for them to stay out of this in order to prevent further embarrassments on the entire entity. That is irresponsible on NIA part to come and claim the money now. How on earth could intelligent body such as NIA kept a huge cash and nobody was in the building monitoring that money. Please tell me another lie. It is like saying FBI is keeping a billion of dollars in its office for the purpose of spending it on investigation. You guys must stop embarrassing us among international communities. As competent as NIA is, it doesn’t possess a check or vouchers, it can only operates by giving out cash, how ridiculous that sounds. It seems that the leaderships of NIA have failed in their duty by staggering that huge amount of money which I believe is a lie since they were smart enough not to keep such huge money in any of their liaison office. Let me say this, at this point, even the dumbest person in Nigeria will know that, this is a plot to twist the investigation. By claiming the money belongs to NIA will keep people mouth shut but it won’t work this time around because President Buhari has already aware about this case and he has directed his AG to give him final report on investigation as to who owns that money. If anyone wants to play with his job especially among the high ranking officers in EFCC or NIA, let him obstruct this investigation. May God saves us from these heartless mightiest. That money belongs to a politician and they are trying to cover up for him. Is the tower the central bank where the money should have been deposited in a special account? Safe house in an apartment? what if the house catches fire and the money gets burnt? or was the money stored in an indestructible safe or fire safe drawers? If the money was for the use of NIA operations, why are they in dollars, pounds, and naira? why not in Naira since they are for use in Nigeria? Olori buruku niyin! Aye yin de ma baje l’oju emi yin, aisan ti ko gbo ogun lo ma paa yin dahun. And you package a lie like product! Buhari, if u shoup this lie you go die of your sickness. I swear! U told us that nigeria is undergoing recession.They categorized money like cloths. Some in dollar, some in euro, some in pound and some in naira. What they can do to wave spell on their heads is that CBN should collect the money, add to 2018 budget, NIA should rewrite their requicition proposal to FG and devend it. Lastly, EFCC should not budder who owns the money? They hv seen the money, no individual or boby clarm the money. Ama tan rawapa in nigeria. The NIA has never heard the word “bank” before hence the HUGE cash being kept in a safe house? The more attempt is made to explain the more unbelievable it sounds. It is even cause for wonder whether this is not some ruse to prevent the whistle blower from getting the promised share of this money! I have stopped crying for Nigeria. All I do now is laugh. ????????????????. What is bunch of jokers. I was reading an article about this issue on Sahara report. The writer said that the whistle blower who is a security guard saw a woman carrying bags into the apartment. Why should you tell us the identity of the whistle blower. I learnt the security guard is now in hi ding for fear of his life. .This is the reason I laugh.